After much thought, I’ve requested removal of my DNA test kit from the FamilyTreeDNA site. The lack of transparency on the part of FamilyTreeDNA has weighed heavy in my decision. As Bennett Greenspan (President of FamilyTreeDNA) indicated in his statement, the Terms of Service of FamilyTreeDNA in regards to law enforcement were changed in December 2018 without notifying customers. For any genealogy DNA company to make such changes to their Terms of Service in the 21st century era of privacy and data concerns without notifying customers shows extremely poor judgment. I’m not opposed to the use of genealogical DNA test sites for law enforcement in certain situations-far from it. In fact I have my test kit at GedMatch.com which has been used in several high profile criminal cases. 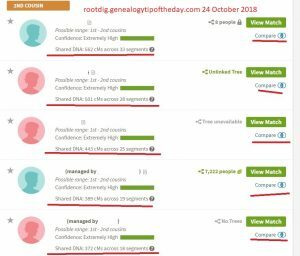 FamilyTreeDNA did not make users aware of the December changes until those changes were noticed by the media this past week. Greenspan’s letter to customers can be viewed on the Mailchimp site. I fully understand your privacy concerns on a personal level. Then why were customers not personally notified about the changes in the Terms of Service in December? It woulds seem to me that someone who fully understands privacy concerns would have seen the need to tell customers about this change. FamilyTreeDNA has gone back to the May 2018 Terms of Service as a result of the dust up over the now-retracted December 2018 changes. Those changed terms (the May 2018 version) were sent to customers when those changes were made in FamilyTreeDNA’s effort to become GDPR-compliant in May of 2018. Readers are encouraged to find out more and to decide for themselves. I don’t expect complete privacy in 2019. I understand the world in which we live. I just expect a company who “fully understands” privacy concerns to be a little more forthcoming without the media and the genealogical community doing your “forthcoming” for you. ← My Mother-in-Law is Your Mother, Right? What is the point in removing your DNA from one site but leaving it at another? Especially leaving it at GEDMatch which is known for assisting law enforcement? I think you’ve locked the barn door a little too late. My kits will stay where they are. My whole point in doing DNA testing was to find ancestors. I won’t find them by eliminating the pools I’m fishing in. I may not find them if everyone panics and removes their information. Your test results are already “out there”. How many family trees have you in them already? FTDNA made an error, no doubt. I don’t intend to compound it just so I can cut off my nose to spite my face. My concern with FamilyTreeDNA was they way they handled their changes in the terms of service and, like any customer, I can choose whether to use their service or not. As I’ve mentioned before, I have no issue with law enforcement using the tests in the way they have done at GedMatch and law enforcement concerns played no role in my decision. I understand that others may take a different view. I’ve been in online trees since the earliest days of the internet and anyone who wants to know who my parents, etc. are can easily figure that out…that’s not a concern.